Instabill attends 10-12 payments tradeshows a year, both in the U.S. and Europe, and we do our absolute best to make the most of them. In fact, we’re heading to Las Vegas next week for the Affiliate Summit West conference Jan. 10-12, then back to Boston for the Northeast Acquirers Association trade show Jan. 13-15. We may attend another in London in early February. It got us thinking about how we could expand on Ms. Jackson’s blog. So we’re offering five additional rules of exhibition stand etiquette of our own. Remember that episode of The Office when Michael and Dwight attend the Northeast Office Supplies Convention, but are more consumed with hosting an after-hours party than meeting prospects? Tradeshow after-hours present excellent opportunities to meet new prospects in a more relaxed setting. That will put a damper on your traffic. We bring a very large backdrop to each show – probably 12×12 feet – and it’s very hard not to notice it. We want to be among the earliest attendees to set up so that our colleagues and neighbors know who we are and what we offer. We consider it free and open advertising, and it also sends a message to other attendees: Instabill is here, organized and ready to talk. I remember my first convention, forgetting we would need a small table and a couple of chairs. Fortunately, I could rent them from the good folks hosting the show. Unfortunately, it put me way over budget. Renting furnishings at shows costs a bundle. In the weeks or days before a show, find a nearby Target, Marshalls or Home Goods. Purchase what you might need and cab it to the show. Afterward, donate it to a local thrift shop, or offer it to one of the convention hall workers. You’ll be glad you did. With a little thought and effort, creativity in what you’re giving away at your stand can go a long way. At each of our tradeshows last year, Instabill offered mobile phone wallet holders – a silicone pocket that adheres to your mobile phone to hold your license and credit cards. They were hugely popular. I’ve encountered far too many instances where the person with whom I’m speaking has run out of business cards. This is a breach of exhibition stand etiquette 101! 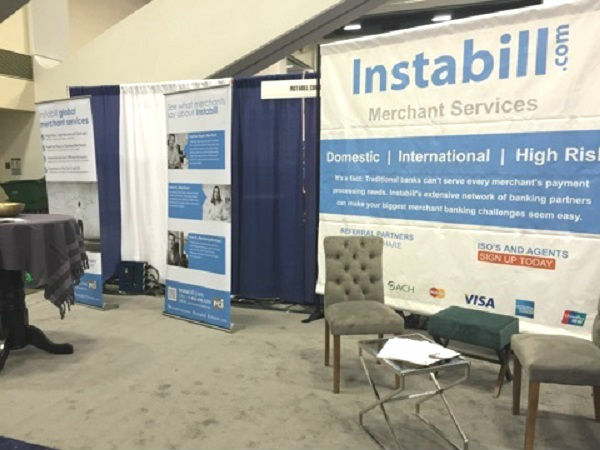 Instabill attends up to a dozen tradeshows and conferences each year, such as Transact 15, ICE Totally Gaming as well as the regional acquirers conventions such as Western States, Northeast and Midwest. Check out our tradeshow schedule to see where we’ll be next and meet with us about our high risk merchant account solutions.